Over the weekend, in between all the other tasks I do as husband, father, home owner and tax payer, I cobbled together a Go programming environment using Vim on my Ubuntu 14.10 notebook. Adding this capability required that I install Go, Go tools, and a series of Vim plugins pulled from Github. Go, in case you’re curious, is aimed more at systems level programming (which is where I tend to reside). 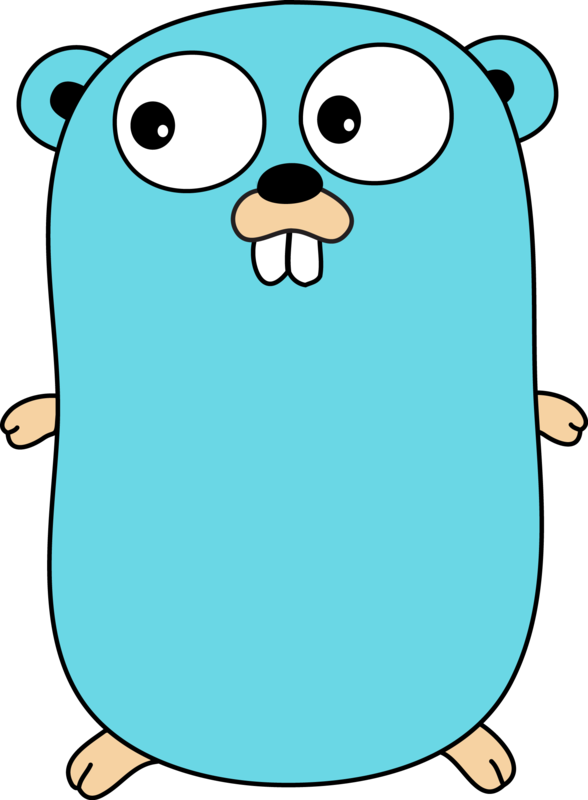 Go is also a Google product, invented by two of the most iconic hackers the software world knows: Rob Pike and Ken Thompson. I know of Rob Pike primarily through his book “The Unix Programming Environment” he wrote along with Brian Kernighan. I’ve had that book since the late 1980s, along with “The C Programming Language.” That latter book was co-written by Ken Thompson along with Brian Kernighan (as well). And, of course, in his spare time, Ken Thompson was the principal inventor of Unix. And they’re now both working for Google Research. Beyond Go’s stellar heritage, there are many reasons to use Go. Two that come immediately to my mind are Go’s ability to work closely with C/C++ code and Dave Cheney’s “Unofficial ARM Tarballs for Go” for various ARM-based tiny computers. One of the unofficial ARM targets is ARM6 and the Raspberry Pi. A second target is ARM7 and the Beagle Bone Black Rev C. The goal of this exercise is thus in two parts: get Go tooling up and running under Ubuntu, start developing Go under Ubuntu, run the products of said development under Raspbian on the Raspberry Pi using one of the unofficial tarballs, then move the entire development environment over to the Raspberry Pi itself if all of that works satisfactorily. Setting up Go is straightforward in Ubuntu (or another other major OS). The best way is to go follow the steps on the Golang site: download, follow the directions exactly, and then you’re done. That sets up the initial Go build/run environment, and you can start writing code from that point. For this exercise I downloaded and installed Go 1.4.1. The blog entry has everything you need to do broken down in easy-to-follow steps. Here are my comments on those steps. My version of Vim was the same, but built October 2014. I downloaded and installed Go version 1.4.1. I know how to add Vim plugins, and that’s the route I chose. For installing godef, make sure you have Mercurial installed. I didn’t and installation failed the first time. I installed all the plugins via git clone from Github. I’m using Pathogen to rule them all. 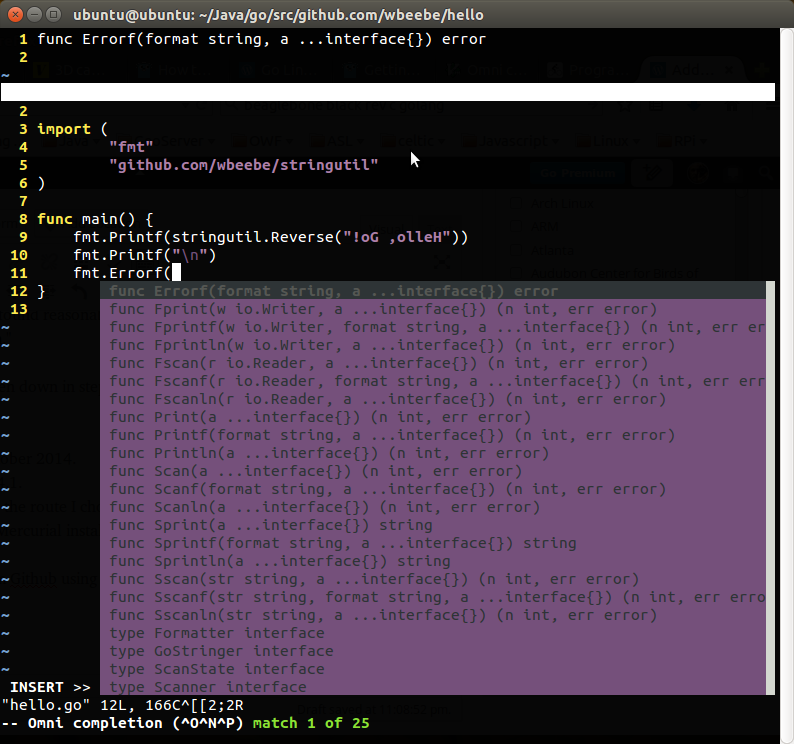 Here’s Vim performing an IDE-like function, code completion in a tiny snippet of Go code. It was this feature I wanted more than any other. I can keep the general language in my head, but code completion helps to “remember” it all. I do need to tweak the colors a bit; gray on purple doesn’t quite make it (white or yellow would be better), but it’s usable regardless. Here’s my .vimrc with what I’ve enabled so far. It will change quickly.